This year’s Clinicians Retreat was attended by 8 trauma clinicians (4 Vet Center, 1 VAMC, 3 Private Practice) and 2 interns, all who work with combat Veterans. The first day of the retreat (Friday) started with lunch and an informal “meet and greet”. This was followed by facilitated introduction activities which encouraged more in-depth sharing. This was followed by participation in a Native American Sweat Lodge Healing Ceremony with a focus on clinicians off-loading many of the toxins they had picked up along the way in their clinical work. Following the sweat, participants partook in a taco bar and a bit of down time. The day ended with a “Fire Circle” group dynamic that included intention-setting and an encouragement for open sharing, something often difficult for clinicians. Saturday started with stretches and movement entitled “Morning Mobility”. After breakfast, participants traveled to Kootenai Falls and suspension bridge for a spectacular hike, sack lunches in hand. Upon return from the hike in early afternoon, participants were invited to observe and participate in a naming ceremony for Dante and Terra’s son, Sandro, who now also bears the name, Little Badger. Once this ceremony concluded, clinicians were invited to participate in a collage art project. In this project, these practitioners were encouraged to divide their poster board into four segments: Who they really are, why they became clinicians, ways in which the work has affected them, what next steps in personal growth and wellness look like for them as individuals. After these collages were completed, a number of clinicians participated in a second Native American sweat lodge, again with an emphasis on personal healing. Dinner followed soon thereafter. That evening, another “Fire Circle” group dynamic took place with an emphasis on clinicians sharing their collage art projects. This task led into deeper processing and discussion. Sunday morning again started with morning mobility and breakfast. After breaking camp, participants convoyed to Ross Creek Cedar Grove for a nature walk amongst giant cedars and rock alters. It seems nearly impossible for me to start one of these posts from a place other than that of deep gratitude. Our organization is blessed to have the support we recieve from the community. This retreat, as with many of the programs we offer, was only possible through the support of community members, local families, local businesses, various local fire departments and the Spokane Vet Center. 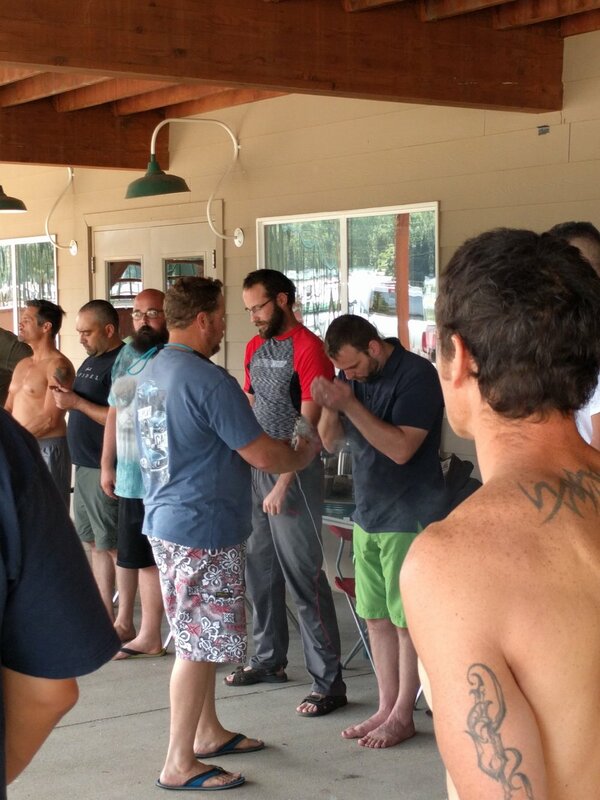 This year we served 25 veterans at our Modern Warrior Retreat, over a third of them are new to are organization, several who have attended a retreat in the past and a few who are now in a support role and showed up to be of service. Each year this retreat is held in honor of a fallen service member. This year we honored Jacob Hess, Sgt. USMC. 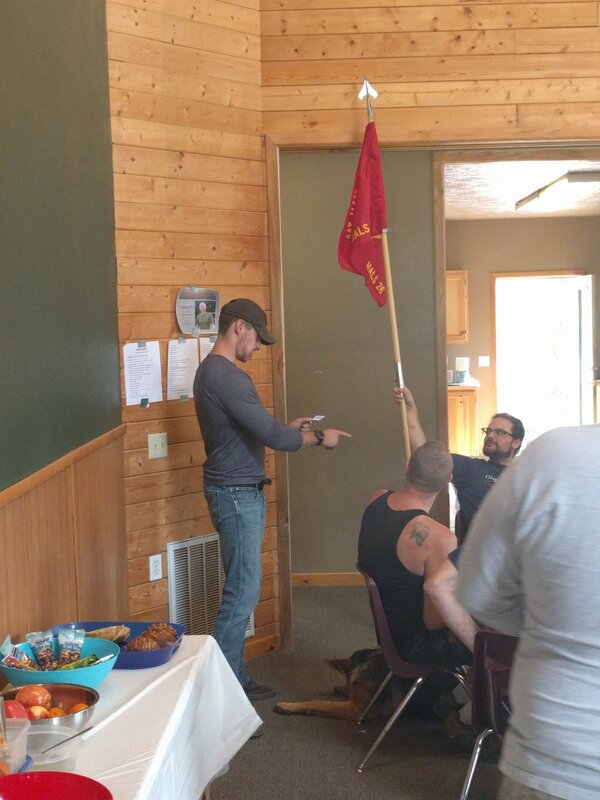 Throughout the retreat we carried a guidon honoring Jacob. The guidon was with us from the opening ceremony at Spokane Valley Fire Dept. Station 10 to the closing ceremony at the Spokane Gun Club. The guidon was with us as we laughed, embarrassed ourselves, challenged our fears and even shed some tears while building cohesion. It was there as we learned about Native American Sweat Lodges and how this practice has been used to heal warriors for hundreds of years. It sat watch as we woke our bodies up with a morning yoga sessions. The guidon showed us the direction of the wind as we challenged each other to an archery contest and was there as we played an intense game of kayak polo and explored Deer Lake. It witnessed veterans learning how to make bracelets out of parachord and playing a military version of Speak Out. The guidon was with us as we enjoyed amazing meals prepared by volunteers, firefighters, and board members. It was there as we enjoyed a meal with the Jorgenson family and spent the afternoon boating on Deer Lake. Our guidon stood over us as many of us were humbled during a friendly game of Annie Oakley at the Spokane Gun Club. Everything this guidon bore witness to was in service of our mission, to bring our nations veterans all the way home. Our guidon has seen a great deal of pain moving toward healing, isolation moving toward connection, fear moving toward hope, and light hearted smiles on faces that are often heavy with the somberness of war. On August 5 of this year, Veterans Community Response members teamed up with the Big Sky Brewing crew and friends for our 8th annual highway cleanup and river float. This year we set a new record. Thirty of us cleaned 7 miles of Highway 2, collecting more than 70 bags of trash. We are greatly honored to be the stewards of a special stretch of highway. In 2010, we were returning home from our first Montana Combat Veterans retreat when we noticed large amounts of trash around the monument on Highway 2 at the Marias Pass summit. We cleaned over eight bags of trash that evening, and the next day VCR (then named Community Focused Disaster Response) and Big Sky Brewing Company adopted a three-mile stretch of Highway 2 including the summit at the Continental Divide. This thin ribbon of road is the only barrier separating the 1.4 million acre Bob Marshall Wilderness Complex to the south and Glacier Park’s one million acres. As such, it is a very special place, known as “The Crown of The Continent”, and deserves the best care and respect. Each year we choose an unadopted stretch of road and clean it as well. After a rigorous morning of cleaning highway, we boated down the Middle Fork of the Flathead River. This is a relaxed fun float where wildlife encounters are common. It’s a great reward for the hard work. 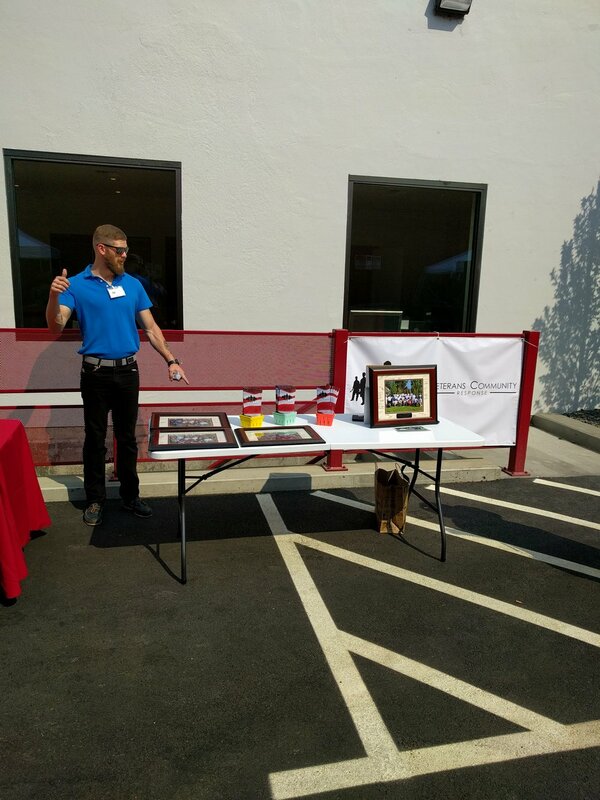 Veterans Community Response would like to thank all those over at 4 Degrees Real Estate for their kindness and generosity. We at VCR are deeply thankful for the support that we received from all members of the 4 Degrees team. We look forward to growing our partnership and attending future events with 4 Degrees Real Estate. I would not feel right starting this post with anything but a huge thank you to the team at 49 Degrees North! For the 4th year in a row, 49 Degrees North has welcomed our veterans to join them for a full day of skiing/boarding. 49 Degrees provided rentals and lessons for the veterans just getting in to the sport and mother nature continuously brought the snow for the more advanced riders who were ready to rip. 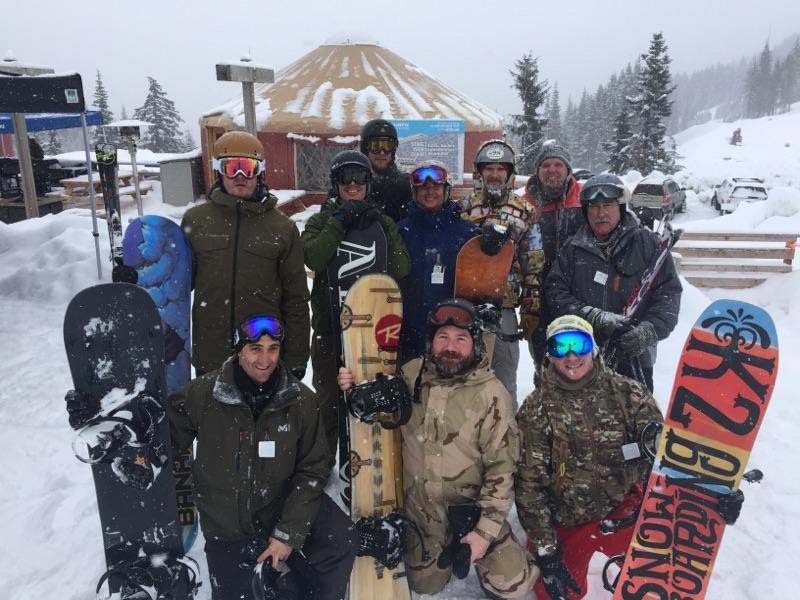 We had most of the veterans who participated in today’s event on the snow not long after first chair and less than an hour later had an 8 rider crew chasing each other through the trees while blasting through lightly tracked powder. I saw some big smiles on faces that don’t smile as often as they had before war and I heard laughter in voices that don’t laugh as often. For me this is what it is all about! Today I was blessed to have many great chairlift conversations with staff, volunteers and veterans. One that stands out occurred towards the end of the day. A veteran was telling me about a shift he has been noticing as he has started to “feel healthy again” and how at this point in his process of getting back to life after war he feels one of his greatest joys is sharing the activities that he loves with others. We talked about the challenging but necessary process of building a meaningful post war life that includes plenty of G.T.F.O.! Up here in the Inland Northwest, we are surrounded by nature and can be outdoors bathing in it in minutes. Couple that with comradery of a fellow veteran or a group of fellow veterans and you have some powerful ingredients for cooking up post war health. Add in a couple cartwheel wrecks and yard sales in fresh fluffy pow for good measure. Again, I can confidently say I speak for the whole VCR team when I say this is what it is all about and this is why we do what we do! Thank you to all the veterans and their guests for showing up and making this a great day for everyone involved. If you are a veteran of any war and are interested in joining us for our last ski day of the 2016/2017 season please call (509) 730-9413 to get signed up. This is where it all started for many leaders of the Spokane veteran community. The Deer Lake OIF/OEF Retreat changed all of us as we grew from the experiences that we’ve shared at this wonderful place. One constant through the years has been the meals cooked by firefighters who have demonstrated so much support for their brother warriors. As our organization has evolved, so have the activities that we offer in conjunction with our retreats. This year’s Deer Lake Retreat included sweat lodge ceremonies, high and low ropes courses, rock climbing, and trap shooting. We find activities involving water to be particularly cleansing and healing; these included water polo, kayaking, tubing, and fishing. Adding to the relaxing environment were yoga and massage sessions. As usual Ma J opened her lakefront home to us and hosted a feast that has become an annual celebration of the service of these warriors and a remembrance of the fallen. She fed us and let us enjoy her piece of heaven even if it was only for a day. Participants are able to breath and relax, helping to clear minds of haunting or tormenting thoughts. This combination of relaxation and activity helps to bring on the great sleep that helps with effective healing. As a final send-off, rock climbing and trap shooting send participants home with a bang. Veterans left with a networked support system to help them pave the way forward and become an integral part of the community. As always, WE EMPOWER OUR VETERANS. 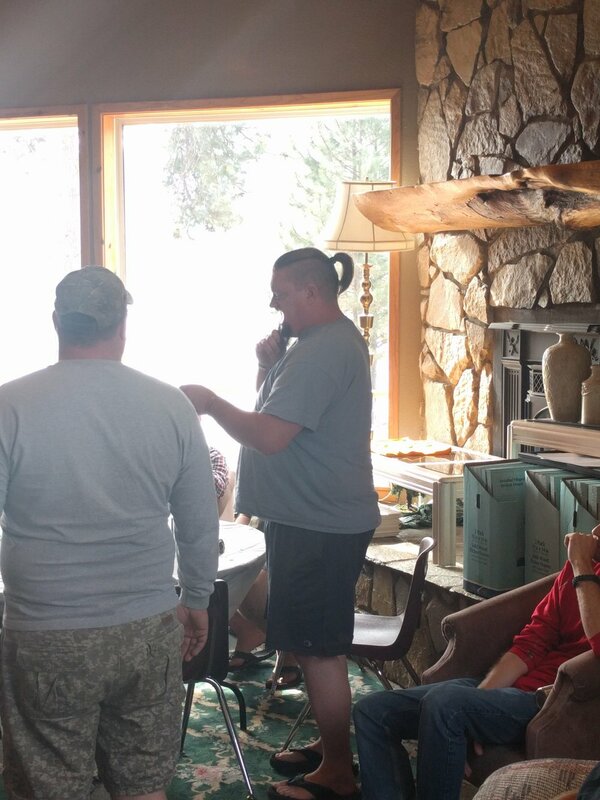 From September 28 – October 1, Veterans Community Response held a Vietnam Combat Veterans Retreat at Glacier Trailhead Cabins. Over the past 7 years we have hosted around 25 different Combat Veterans retreats as well as a number of other missions and events. We see a lot of transformation, but something special and unique happened at this latest retreat. 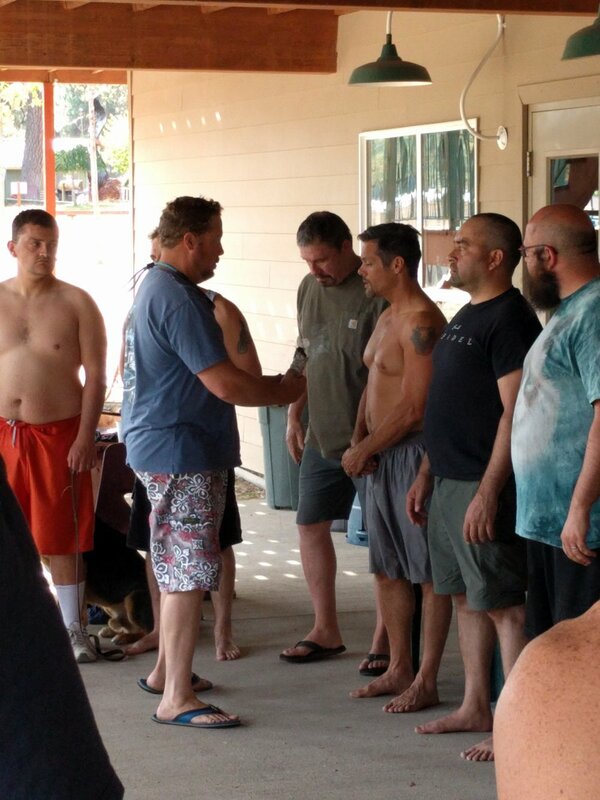 Every retreat has seen breakthrough moments for some vets, life direction changes for others, and the formation of new friendships and support groups for many. Every year we are blessed to witness vets going from suicidal states to becoming reborn warriors and moving into new lives with inspiration and purpose. We work to balance the fraternal, clinical and spiritual aspects of our retreats. Our cultural advisors from The Blackfeet Nation guide retreat staff and clients through powerful ceremonies at every retreat. This has been an especially intense and difficult summer for me as VCR increased our workload and lost some critical members of our team. I had to take on a few extra workloads this year, and that took its toll on me. Running VCR stopped feeling like an honor and started feeling like a heavy burden. My tank was empty. Coming to the last retreat I was on autopilot, just looking forward to the end of the retreat season. I felt something different at this retreat from the moment we began building the sweat lodge, a buzz in the air. Craig Falcon led the staff sweat the night before the Vets arrival and we centered our energy and intent. Exiting the sweat lodge it’s impossible to not feel awe and wonder, so I wasn’t surprised to feel stress and anxiety melting away. Glacier Trailhead Cabins is set between two sacred mountains – Chief Mountain to the north, Divide Mountain to the south and in front of us the jaw dropping beauty of Glacier Park. Each morning, Craig led us in welcoming the Sun with a short ceremony of smudging, praying and intention setting. Our first morning we closed our eyes to pray with a thick fog all around. As I listened to the Blackfeet intonation and set my own intent, I felt a change. When we opened our eyes the fog was gone and blue skies welcomed the sun’s rays to the peaks of Glacier. On the third day we all went to Chief Mountain and experienced a sacred pipe ceremony and an eagle feather ceremony. Each of us took our prayers to our own private place in the forest and suddenly coyotes started calling to each other, very close to us. Craig had talked to us of the importance of bringing the whole warrior home and being sure to shed the extra baggage of intense trauma. When I tied my tobacco bundle to a tree, asking Creator to take what didn’t serve me and to help guide me to better service, a wind picked up and I felt a load of junk float away. When I called myself home as instructed, I felt like a missing part of me did come back. As I walked back to the clearing, careful not to touch the decades of prayer clothes and offerings that adorn this sacred site, I felt jubilant, powerful, excited and mystified. When I reached the meadow, a staff member and vet came up to me and related a powerful experience of his own, a powerful discovery in the forest that was left by another and he was guided to, a powerful message seemingly written just for him . Then another VCR staffer tells me of his powerful experience, then another staffer in tears tells me of his own powerful experience and how important VCR has been for him, and then I’m noticing that all the vets are quiet and thoughtful, all seeming to have undergone an intense and positive experience. Everyone was searching for ways to honor this sacred site, to give something back. I saw everyone scouring the sacred meadow for anything out of place, being careful to leave prayers and offerings undisturbed. We took over three bags of garbage off the Chief Mountain road over the three miles from meadow to pavement. Later that afternoon in the sweat lodge I had the opportunity to sit and talk alone with a grizzled USMC Sargeant after the others had exited the lodge in between rounds. He told me how he had led men into battle, leading some to their deaths, and tried to impart to me the burden this left on his heart and soul. Then he told me that this retreat was one of the most impactful and important experiences of his and the other vets lives, that he was now home in a new way. Later that night I left the retreat early to drive the 6 hours back to Spokane to be ready for work the next morning, I realized that I had witnessed something intensely powerful and transformative. Affecting not just these vets, but staff as well. I can’t do justice to this in words, and I can’t describe how I know this to be true, but that day on Chief Mountain, a bunch of souls were made whole, and a group of warriors really came home for the first time in forty years. I won’t pretend to bear any responsibility for this power and transformation. I’m just a tool being used to complete a purpose. I want to thank everyone who plays an equal role to me in making these retreats happen. All the people who donate their lodging, food, time, service and energy to healing our warriors and helping them find their way home. You all make this happen through your energy and intent, and it is effective and good. We are changing lives. Thank you all for being part of this team. The counselors and therapists who have given so much for our veteran communities need their own time to decompress and reset. As a thank you to these hard-working individuals, VCR hosted a retreat specifically for clinicians. Swanson Lodge was the setting for this relaxing time where individuals enjoyed the sweat lodge while surrounded by the healing and energizing solitude of the woods. As meals were prepared by off-duty firefighters, retreat participants enjoyed the serene pond and deer filled fields. Activities included art projects, naps, yoga, and hikes on a beautiful trail that wound through cedar trees that seemed to speak their own stories. A dry creek bed, full of the memories of travelers past, contributed to the blissful atmosphere as hikers strolled toward the waterfalls while goats watched from the steep slopes above.